Pancreatic cancer is currently very difficult to detect while it is still resectable. A new blood test can detect pancreatic cancer in the very earliest stages of the disease. "Our test can detect pancreatic cancer with 96% accuracy at stage I and II, while there is still the possibility of successful surgical intervention. There is currently no cure and few treatment options for advanced pancreatic cancer, which is the late stage when pancreatic cancer is usually diagnosed," explains Carl Borrebaeck (pictured), professor at the department of Immunotechnology at Lund University. Since the immune system is the first to respond to threats like complex diseases, such as cancer, autoimmune diseases and infections, the microarray was designed to mirror this early response. This provides information about the development of tumors long before being visible on CT or detected by ctDNA. From those hundreds of markers, 29 markers were selected to detect pancreatic cancer with 96% accuracy at stage I and II. 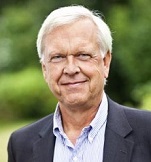 Illustration: Carl Borrebaeck (Photo: Apelöga).